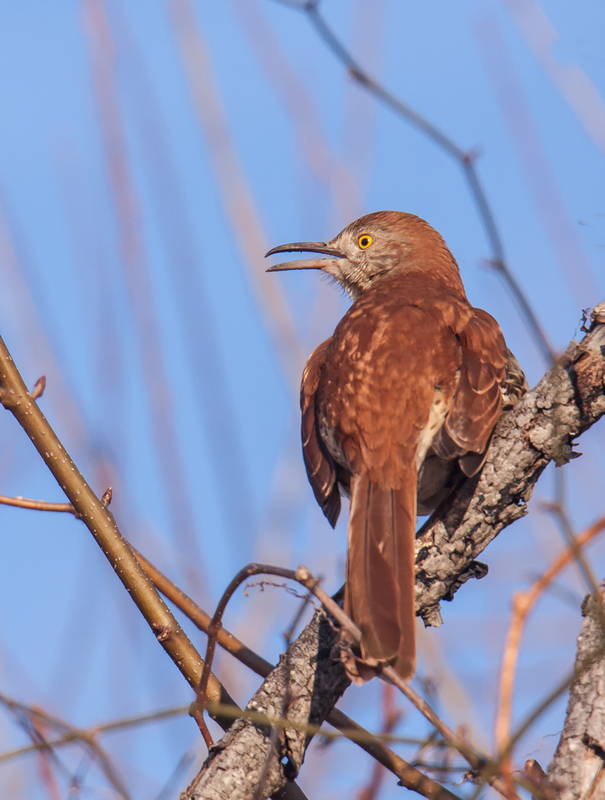 “Brown Thrasher” sounds like it could be the name of a heavy metal band. I was therefore startled by the melodious sounds of the Brown Thrasher (Toxostoma rufum) that I encountered this past Tuesday at Occoquan Bay National Wildlife Refuge. I was entranced by its beautiful song as well as by its stunning yellow eyes. According to the Cornell Lab of Ornithology, “Brown Thrashers, like catbirds and mockingbirds, are mimics with extremely varied repertoires consisting of more than 1,100 song types.” If you click on the link for the Cornell Lab of Ornithology, you will find some samples of the thrasher’s sounds. In case you are curious, the bird’s name comes from its foraging behavior. Brown Thrashers typically feed on the ground, often in heavy undergrowth, and sweep their bills through the leaf litter and soil with quick, sideways motions.